Perrie Edwards has been praised after proudly showing off her freckles on social media. The Little Mix star, 25, admitted on Instagram she used to hide them but now wants to embrace them.Gianna Holmes says having freckles has impacted on her confidence but Perri's post "definitely helps me".Her twin Daniela, who also has freckles, says she's "proud" of the singer for sharing her photo and hopes it can help her sister's insecurities. Gianna and Daniela both have freckles on their arms, face chest and legs. "I'm not too keen on them and not too confident about having them," Gianna told Newsbeat. "I see myself differently to everyone else and compare myself to everyone who doesn't have freckles. "I'm always trying to cover them up with foundation, concealer and everything else." Daniela on the other hand says she's never had a problem with freckles, but thinks Perrie's post is really important. "I instantly sent it to Gianna as soon as I saw it, saying it could help with her insecurities about them, and help her feel positive, happy and embrace them. "We also had friends and family tagging us in the picture as they know how Gianna feels. I'm very proud of Perry for putting it on Instagram." Lizzie Mawson is a model. She thinks Perrie sharing the post with her 8.2 million followers is important. "So many of those followers will be young girls going through high school struggling with their appearance and body image issues. "Freckles are a feature that don't get talked about enough. It's so easy for bullies to pick on things that seem rare or different. "Perrie posting this will give young girls and boys the confidence to not cover them up with an inch of foundation." 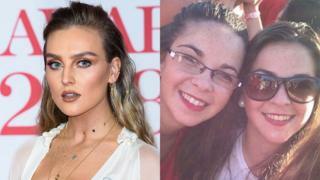 Gianna says Perrie has inspired her to try and change her relationship with her freckles. "It's definitely something positive and something to embrace. I need to stop caring so much. "It's something that will come in time, I'm having to care less each time, it'll come. "But seeing Perry putting it out there definitely helps me as well as a lot of young women who aren't so keen on them." Follow Newsbeat on Instagram, Facebook and Twitter. Listen to Newsbeat live at 12:45 and 17:45 every weekday on BBC Radio 1 and 1Xtra - if you miss us you can listen back here.